""As former and present clients of Dawn McGee, we are very glad to have her as our real estate broker. Dawn worked with us for over five years when she showed us a home that we could not pass up. At no time did Dawn make an excuse or stop looking for us. Dawn is always available for us when we have needed her. Dawn has done such a wonderful job for us, we do not hesitate to recommend her to relatives, friends, and anyone we come in contact. 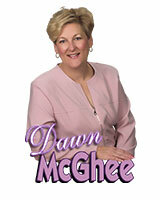 If you want one of the best real estate brokers to work with you, call on Dawn McGhee." ""Dawn went above and beyond anything I have ever heard about any other Realtor. I have relied on her to take care of every little detail and all the ins and outs of selling and buying a home. I trusted her to keep my interests in mind and she has never failed to do just that with both homes I have purchased through her. I never miss an opportunity to tell everyone that Dawn McGhee is the best Realtor. With great thanks and respect"
""Dear Dawn. We thought it was a pleasure to work with you. You are very professional, friendly and accurate. You get down to the point and always let us know where we were standing with our sale.We enjoyed it and will recommend you in the future to others." ""To My Best Friend in the State of Missouri (Not to mention the rest of the Midwest)--Dawn, Thank you very much for your efforts in helping me to buy my first home. I was delighted with how everything went and wanted you to know how much I appreciated it. Just think--I was just coming to you with a major move from the East Coast to help me find a rental--and you helped me buy a home!! I would never have thought it possible! Thanks, too, for my "birthday party" and helping me to get in on my birthday. I suspect now that you had already gotten the cake and card prior to my reminding you about my birthday when I called while on the road on the ride down. A thousand thanks"
""Dawn has always provided me with excellent service. She has been with me through two home purchases and one selling. In all instances I required a short amount of time to either find a home or to sell a home, with two of our closings taking place under 2 weeks. On a limited budget, but still dealing with my high expectations, she was able to find me a perfect home both times. She periodically checks in with me, both by mail and by phone. She is always friendly, open to questions and advice, willing to go the extra mile, and never pushy. Dawn has been great to work with, and I intend on using her services in the future." ""Dear Dawn, We just wanted to thank you for helping us buy two homes and sell one in the past four years! You were always professional, punctual, patient, and very enjoyable. Your greatest attribute is that you listen. Every home you presented was exactly a picture of what we wanted. Your patience is another wonderful trait. We were always concerned we were using too much of your time, being too "picky", or just indecisive. Your demeanor never indicated anything but a positive attitude and assurances we would find our perfect home. Also, at some point during all the viewings of homes over four years, you became our friend--another blessing. Dawn thanks for all your help and support. If we ever buy or sell another house...You're the man?"" ""When we moved from Chesterfield to Columbia, we had the good fortune to have Dawn McGhee to assist us in finding our present home. Although, we have moved on previous occasions, this time, our experience was a very pleasant one because of the perceptiveness, sensitivity, and knowledge that Dawn possesses. We appreciate the tireless effort that Dawn spent while helping us to locate our home. Her warmth and concern for others, as well as, being a true professional in her field of real estate, makes her stand out among her peers. Thank you Dawn--Bill and Zella Spicer"
""When I first met Dawn, I had told her I have never bought a house before. She took the time and professionalism to help me through each stage. She went that extra mile several times to help me make my dream come true--as a 60+ year old man, this is great!"